This is pretty damn cool. 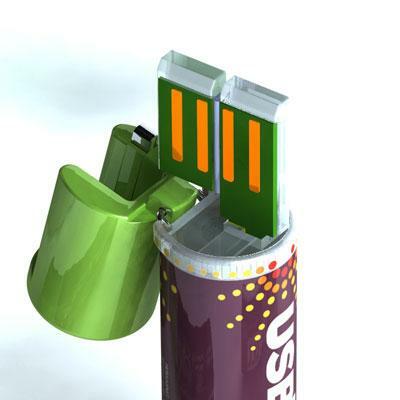 Its a AA rechargeable battery (NiMH) that you can simply plug directly into any powered USB port to recharge. The charger is built in! Yup it actually has a circuit and little LED to tell you when its charging, 90% charged and fully charged. It even shuts off after a certain amount of time. The picture kind of says it all. Its got a neat little cap you pull off to expose the USB connection right under it. 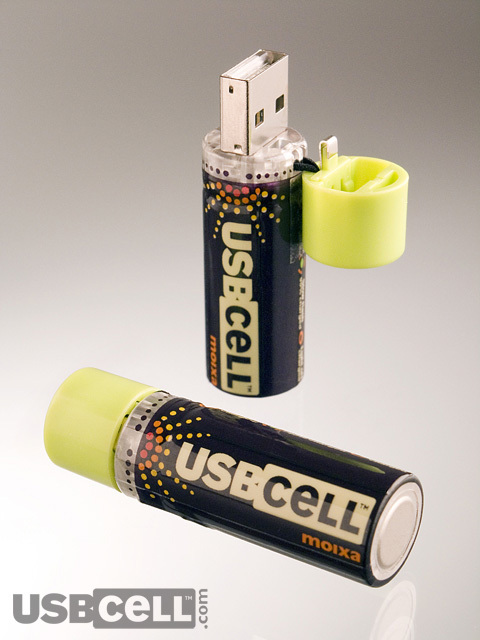 The purpose here, according to the manufacture Moixa Energy, is to encourage people to use rechargeable batteries by making it more convenient to recharge without needing to carry or look for a charger/adapter etc. To keep people from buying alkalines out of convenience. Ok, so now for the downside. According to their website, the battery will take about 5 hours to charge up to 90% capacity from dead. And another 1.5 hours or so to “top-off” the remaining 10%. Then it shuts off automatically. You can put them in a standard charger as long as it doesn’t provide more than 600 mA of current. So these cannot be charged quickly like those 15 min chargers or 2 hour chargers. No matter what you do you are gonna have to wait 5 hrs. Then when you are finally done waiting and you put them in your device, they are only going to last about half as long as other standard AA rechargeable NiMH. The reason is simple, in order for it to have room for the USB connection the actaul battery part of this.. um battery.. is in fact only a 2/3 AA. So the part that stores the energy, the NiMH part, is physically shorter than your standard AA NiMH. And if you look at the specs on their site you’ll see these puppies only offer 1300 mAh. Compare that to an Energizer Rechargeable AA offering 2500 mAh, and you are looking at a conveniently rechargeable battery that last half as long as others. bummer. But still, its pretty cool and convenient. As the site suggests these are especially convenient for computer or video game users who have wireless devices like a wireless controller for example. You can leave these plugged in all day if you want and when your battery in the controller is low, you just swap the dead ones out and put the new ones in. One device I know I would NOT want to use these is in a in a digital camera. I hate when my batteries are dying at the worst moment, so I would rather have AA with tons of mAh, a USBcell would be a step backwards. So its still got its uses, and I think they deserve an A+ for mechanical design and concept. Wish I would of thought of it. And I bet down the road maybe the short 2/3 AA will have more mAh. By the way they are about 4x more expensive than the average AA NiMH, but that’s what you pay for convenience I guess. They are shipped from the UK, where the company is based, for only $3. And they have a “No Quibble” 30 day refund policy. Cant beat that, right? I havent bought them yet but I am considering to try them out. I will let you know how I like it, or not. 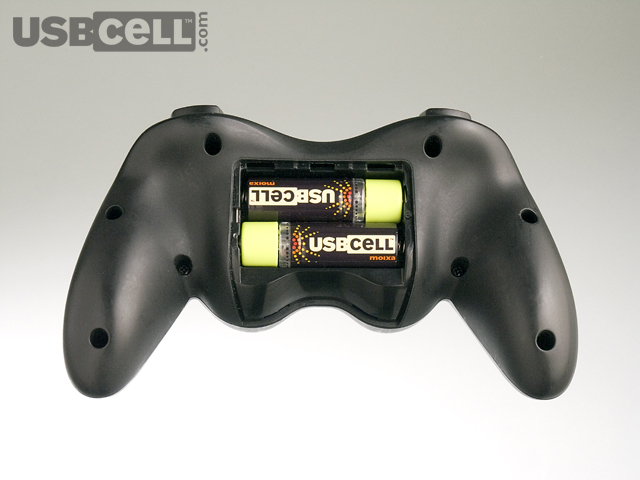 Take a look at their other batteries. They even have a AAA with a USB plug that folds out. How’d they do that? I just found a great link to a video demonstation for this device given by the Moxia CEO and founder Simon Daniels. Thanks to nafcom for finding it. 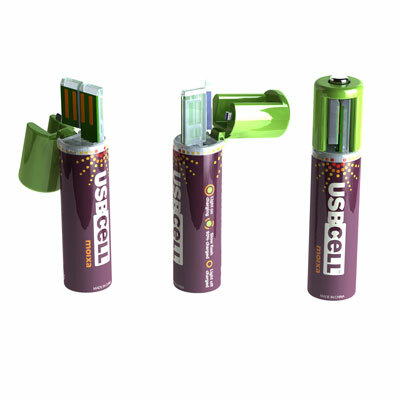 The CEO of USBCELL brings up another “advantage” where he can put a different chip in the battery to “communicate” with the customer while the battery is charging in your PC. A message can pop up on your computer screen to encourage you to recycle. He also envisions bundling it with digital cameras and promoting a photo print service etc. Great so now when I charge one of these things I will have to battle with some annoying pop up ad. Just call it what it is, you are advertizing through hardware, you are not “communicating” you are annoying the customer. All that said, I still think its great technology and I am jealous of Simon Daniels! You really should get them if you are interested, because they are shweet!